All This Could End is told from the third person perspective of two teenagers, Nina and Spencer, whose budding romance is cut short when Nina has to move away. Because her family are secretly bank robbers on the run. Yeah, not your average YA love story, that’s for sure!I have to admit, I had a bit of trouble getting into All This Could End to start with. It wasn’t that I didn’t like it, I just didn’t particularly connect with it. I found once I put it down I wasn’t really compelled to pick it up again ASAP. 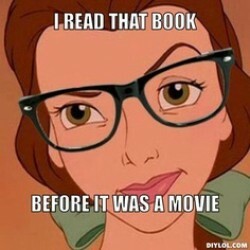 So I read the first 50 or so pages and then a week went by when I didn’t even touch it. I was a bit frustrated by this, and was considering putting it aside to come back to at a later point, but decided to read another chapter first to see if it would grab me.Boy, did it grab me. A couple of hours later I found myself more than half way through the book and realised I was sticking with it after all. So I decided to read one more chapter before bed. The next thing I knew, it was 1am and I had finished. After the initial speed bump it was a page-turner for me, and I loved it.I think what finally drew me in was when Spencer and Nina met and spent one intense night together, talking and laughing and adventuring. It reminded me of all-in-one-night stories like Graffiti Moon, which I adore, and there was a real sense of connection between the characters. After that, I was interested in the development of their relationship and how the events would lead up to Nina holding a gun to Spencer’s head (that’s not a spoiler, BTW, it’s the start of the book, with the rest told in flashback).But while I really liked Nina and Spencer’s chemistry, I have to say I agree with my friend Eleanor in that I wished there had been more “on-screen” time between the two. A great deal of the book is actually focused on their disastrous family lives, and although I definitely appreciated that aspect, and liked that the story wasn’t all-romance-all-the-time, I think it did come at the cost of the development of their relationship. It’s never even really clear whether they are in a relationship or are just friends who have kissed at least once. I liked what was there, I just wanted more. That said, I did really like the exploration of family dynamics. They were tense and heartbreaking and beautifully rendered. I especially loved the sibling relationships that both Nina and Spencer had. Although I do kinda wish at least one character in the novel had a decent mother. I wanted to throttle both Nina and Spencer’s mums. Especially Nina’s. But I didn't mind too much - because while she was truly awful as a mother, she was fascinating as a character.Overall, All This Could End is a unique, refreshing Aussie YA with a great plot, interesting, flawed characters and some lovely – and not-so-lovely – relationships. 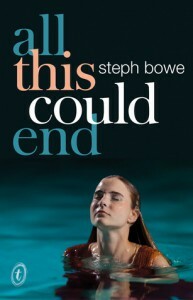 I can’t wait to see what Steph Bowe does next.Like this review? Obligatory blog plug.